Ebenezer Lewis was born at Llanarthney, Carmarthenshire in Wales in the year 1886. At the time of the 1891 Wales census Ebenezer was a scholar aged five years living at Carmarthen with his widowed father (David), a farmer, and his brother David Tom Lewis aged seven and his three year old sister Elizabeth (Lizzie). Four domestic servants were also part of the household where the Welsh language was spoken. Ten years later the Lewis family had moved to the English side of the Welsh border at Westbury-on-Severn, Gloucestershire. Ebenezer’s father was working Ley Fold Farm with the help of his sons David (16) and Ebenezer (13). Mr David Lewis senior had married again and five more children were listed in the English census of 1901 – May, Stanley, Winahan, Evelyn and a baby Lily. Conditions in Australia would have come to the notice of Ebenezer Lewis in his youth. In the early years of the twentieth century Australia was offering incentives to favoured immigrants in various forms such as passage assistance, land grants and free travel to inspect farming blocks, chiefly in order to increase the population especially in rural areas. The opening of the Suez Canal in 1869 gave ships from Europe an alternative route to Australia. By the early 1900s, steamships had become the established method of transport. No longer dependent on the strong winds encountered on the ‘Great Circle’ route, many shipping lines now travelled via the Suez Canal reducing the length of the journey to Australia to 35 to 40 days. For these reasons, some 150,000 state assisted settlers came to Australia between 1906 and the outbreak of World War I. The aims of policy-makers were to people the country's 'empty spaces' for reasons of defence and to boost the population for the purpose of national growth and development. Immigration in this period was inextricably linked with more intensive settlement of the land. Ebenezer Lewis, a 21 year old single man with a farming background in Wales and England, was amongst those who were attracted by these opportunities. He embarked on SS Oruba for Australia from London in June 1908, travelling via Fremantle, Melbourne and Sydney. The Annual Brisbane Exhibition was in progress when the Oruba steamed into the Brisbane River in ideal weather conditions - clear blue skies and exhilarating air, on 5 August 1908. A friendly welcome to the newcomers was organised by members of the Citizens’ League of Welcome and representatives of the Friendly Societies, the Women’s Progressive Club and the Women’s Christian Temperance Union (WCTU). The passengers were transported from Oruba by boat to the Immigration Depot where they were welcomed. After lunch they were taken by bus to the exhibition. They dispersed in groups to “see Queensland in miniature and the State’s prosperous people from town and country.” A rendezvous in the exhibition grounds had been arranged for them at the WCTU tent where they were entertained at tea before being returned to the ferry. As they left they gave hearty cheers for the League and expressed their appreciation for the warm welcome to their new home. Little is known of Ebenezer Lewis’s activities in his new land over the next five years. In Brisbane he attended Wharf Street Congregational Church where he became a member. By 1913 however, he had moved to Lindsay Street Toowoomba and was employed as a grocer. He obtained an apprenticeship with the Toowoomba firm W. C. Peak & Company, exporters. On 14 May 1915, Ebenezer Lewis enlisted in Toowoomba for overseas service in the Australian Imperial Force (AIF). On his attestation paper, he gave his religious denomination as Congregational and for next-of-kin he wrote his older brother’s name, David Tom Lewis and crossed it out, thinking perhaps of the difficulties that would arise should it be necessary to contact him so far away, somewhere in Wales or Gloucestershire. Instead he named Hetty Rodgers of Russell Street Toowoomba, probably a friend. He was then nearly 29 years old though he gave his age as 26 years 10 months. With regimental number 2372, Private Ebenezer Lewis was assigned to reinforcements for the 26th Infantry Battalion and commenced training at Enoggera and the major army training camp at Broadmeadows. His unit embarked from Brisbane on board HMAT A69 Warilda on 5 October 1915, bound for Egypt. Following the evacuation of Gallipoli in December 1915, the AIF was reorganised and expanded in preparation for its transfer to Europe for service in the trenches along the Western Front. This expansion saw several new infantry divisions raised in Egypt and Australia, as well as specialist support units such as machine gun companies, engineer companies, artillery batteries and pioneer battalions. As part of this reorganisation Ebenezer Lewis was transferred while in Egypt on 13 March 1916 to the newly formed 1st Pioneer Battalion, promoted to the rank of lance corporal and worked as a signaller. Trained as infantrymen, the pioneers performed light combat engineer functions in the field, with a large number of personnel possessing trades from civilian life. The concept had existed within the British Indian Army before the war but was adopted by the Australian Army in early 1916 to meet a need for troops with construction and engineering skills to assist with digging trenches, labouring, constructing strong points and undertaking battlefield clearance. At the same time they could be pressed into the line to fight alongside regular infantry where required. A total of five pioneer battalions were raised by the AIF during the war, with one being assigned to each of the five infantry divisions that the Australians deployed to the battlefield in France and Belgium. A pioneer battalion consisted of four companies under a headquarters company. To identify the battalion's personnel they were issued with a purple and white unit colour patch. The colours were in common with other Australian pioneer battalions while the horizontal rectangular shape denoted that the unit was part of the 1st Division. After a short period of training at Serapeum in Egypt in late March 1916 the 1st Pioneer Battalion embarked on a troopship from the port of Alexandria, bound for Marseilles. After landing in France, they boarded a train and were transported to the Somme. From there the 1st Pioneers moved to Armentières where they established a camp in an area which was dubbed a "nursery" sector by the Allies where newly arrived units could gain their first experience of fighting on the Western Front. They later entered the front line around Fleurbaix. At Fleurbaix, the 1st Pioneers received new equipment and in late May assisted the 2nd Australian Tunnelling Company in digging a mine towards German lines around the Cordonnerie Salient where they were positioned opposite the 6th Bavarian Reserve Division. On the night of 30/31 May, the sector of the line the pioneers were digging under was subjected to a heavy artillery bombardment, followed by a trench raid. In the confusion that followed several of the battalion's personnel were killed or taken prisoner. Lance Corporal Lewis survived this ordeal. 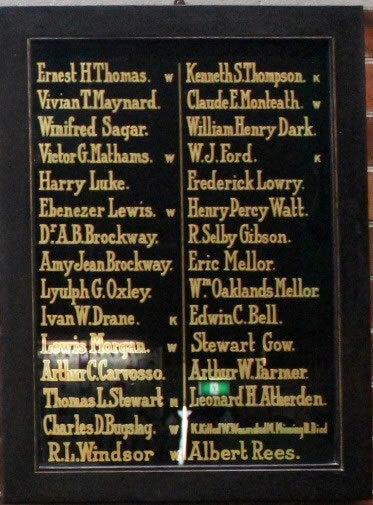 One member of the battalion, Private William Cox, was mentioned in despatches posthumously for his actions during the raid, refusing to leave his pumping station despite the danger and despite already having been wounded. After the battalion's introduction to trench warfare around Fleurbaix it participated in the Battle of Pozieres in July 1916 where, under the command of Lieutenant Colonel Edmund Nicholson – an artillery officer who had served at Gallipoli – they laid the form-up trench for the attack before being committed to the capture of the village itself. The battalion's losses in its first battle amounted to 180 killed or wounded. Lance Corporal Lewis received shrapnel wounds to the left foot on 26 July 1916, a lasting injury that caused his early return to Australia twelve months later. After hospital treatment at first in Rouen France and later at Portsmouth in England, he returned to Australia on the sea transport ship HMAT Nestor A71 departing England on 22 July 1917. Ebenezer Lewis disembarked at Melbourne and travelled overland to Brisbane where he was discharged on 10 November 1917. Ebenezer Lewis returned to Toowoomba. He married Sybil Grace Wilshire at St Stephen’s Presbyterian Church on Easter Monday 2 April 1923. The minister, Rev William Johnston officiated. The lucky horseshoe carried by the bride was tied with purple and white ribbons, the colours of the 1st Pioneers. The couple left by the afternoon train for their honeymoon at Currumbin. Ebenezer and Sybil Lewis made their home at North Street in the Toowoomba suburb of Harlaxton for about twenty-five years. His occupation is recorded as attendant, later male nurse. In the 1950s they lived at 12 Bath Street North Toowoomba. In their retirement they travelled to ‘the old country’ returning by SS Largs Bay via the Port of Fremantle in 1953. Ebenezer Lewis died in the year 1957. Widowed for some twenty years, Mrs Sybil Lewis resided at 87a Taylor Street until the early 1980s. • Brisbane Courier, 14 August 1908, page 5; 5 April 1923, page 15.